With all the hullabaloo around Pete Rose's "admission" yesterday that he "bet on the Reds every night" — a story so overblown that even Katie Couric was talking about it, chatting with beer pong specialist Armen Keteyian — Keith Olbermann, who did the Rose interview along with Dan Patrick on ESPN Radio, chimes in to point out that not only did Pete not say anything new, he was less confessing than he was clarifying. His admission of nightly betting came up only because, before he came on the air with us, I had repeated the standard history of his gambling while Reds' manager: that he never bet against his own team, but that he often didn't bet at all on their games. This, to me, was as great a transgression as the gambling itself, because it left open the prospect that he wouldn't use his closer or would rest his key players during the games in which he had no wager. To me that was a kind of passive-aggressive game-fixing. Rose was correcting me. Used that term. The emphasis was not "I BET on the Reds every night," but "I bet on the Reds EVERY night." To me, that takes a little of the sting out of the process. 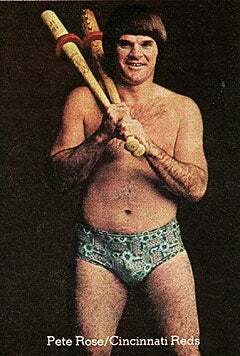 At least Pete Rose the manager wasn't subservient to Pete Rose the compulsive gambler. At least the game outcomes weren't affected because he was saving John Franco until a night he had $500 riding on the result. Remember, that's the point of all this: Whether Rose could have fixed a game. The perception of the interview does seem to skew a bit from its actual content. We do respect Rose's devotion to his team, though; we think he actually bet on the Reds to win that interview.